Russia and the Central African Republic (CAR) signed a military cooperation agreement on August 21. Russian Defense Minister Sergey Shoygu and his CAR counterpart Marie-Noelle Koyara met on the sidelines of the Army 2018 defense expo outside of Moscow to finalize that agreement. According to the Russian defense chief, Central Africa “is a promising partner on the African continent." The document covers arms shipments and personnel training. Central African officers will undergo training courses at Russian military academies and colleges. This year, Russia has already sent light arms, rocket launchers, and anti-aircraft guns for two battalions. It has 175 military and civilian instructors deployed in that country to train the personnel. In mid-December, the United Nations granted Russia an exemption to the arms embargo on the CAR, paving the way for deliveries of weapons to that war-torn country that is still immersed in an internal conflict. The embargo is effective until Jan. 31, 2019. The UN ranks the CAR as the least-developed country in the world despite its minerals reserves. Fourteen thousand UN peacekeepers are stationed within its borders, but the government, led by President Faustin-Archange Touadera, believes that that operation is ineffective. He has relied more on Russia’s help. This agreement is part of that trend. Russia’s regional influence is increasing. The Democratic Republic of Congo has recently decided to revive its 1999 agreement on military cooperation with Russia. In April, Mozambique agreed to open its ports to Russian naval vessels. It was recently reported that Niger is interested in purchasing Russian helicopters and firearms, including grenade launchers. Russia and Guinea are working on a military agreement, which would include free access for Russian military ships to the country’s ports, training, and other security-related issues. Russia exports Mil Mi-8/17 and Mi-24/35 helicopters to Angola, Mali, Nigeria, Sudan, Uganda, and Rwanda. The Russian Federation has military partnerships with Cameroon, the Democratic Republic of Congo (DRC), Nigeria, Kenya, Burkina Faso, Uganda, South Sudan, Mozambique, and Angola. In 2017, Sudan’s President Omar al-Bashir asked Russia to protect his country “from the aggressive acts of the United States." All in all, Russia is responsible for 30% of all arms supplies to the region. The military cooperation goes hand-in-hand with progress in other areas. In March, Russian Foreign Minister Sergey Lavrov went on a five-day African tour to visit Namibia, Zimbabwe, Angola, Mozambique, and Ethiopia. He signed trade agreements with Angola and Mozambique and also strengthened diplomatic ties with Zimbabwe’s new government. Russian companies are exploring the Darwendale platinum deposit, one of the largest in the world. Russia’s Alrosa is present in Angola, a country rich in diamonds. Moscow and Luanda are engaged in talks over cooperation in hydrocarbon production. 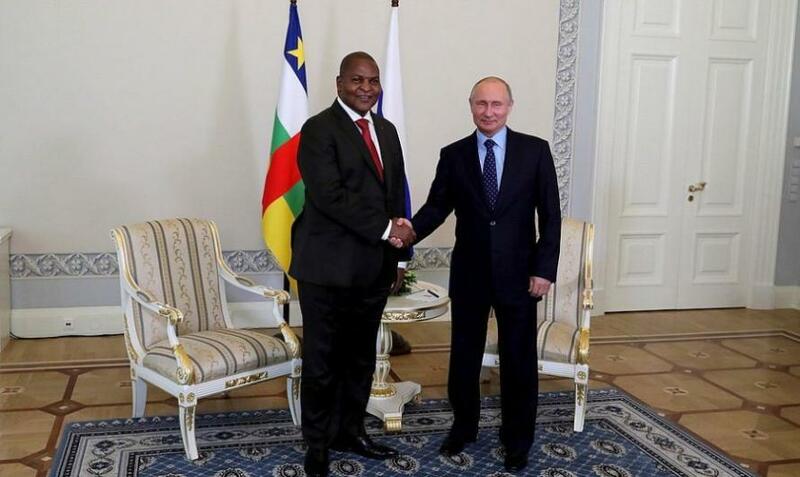 Last October, Russia signeda $20 billion agreement to construct two nuclear power plants in Nigeria.It recently established a special relationship with Rwanda toreconnect Russia with the East African community. Benin, Ethiopia, Guinea, Mozambique, Tanzania, and Zambia, among others, have all been recipients of Russian debt relief over the past decade. Russia is working with Zimbabwe's and Guinea's mining industries and also cooperates on nuclear power with Sudan. Russia and the African Union (AU) are currently in the process of drafting a conceptual framework cooperation agreement. Moscow can offer its growingability to support peacekeeping operations and training for the African Union personnel, as well as the sharing of intelligence data about foreign terrorists with the African International data bank. The Russian Federation contributes to the UN peacekeeping operations in Western Sahara, the Democratic Republic of Congo, Cote d’Ivoire, Ethiopia, Eritrea, Liberia, Sudan, and South Sudan. Russiashowcased African business at the 2018 St. Petersburg International Economic Forum. It is set to host a Russian-African Union forum in 2019. According to Foreign Affairs Minister Sergey Lavrov, the forum will roll out a comprehensive, strategic road map for more economic cooperation and a wide range of investment possibilities, plus effective ways of addressing regional security issues and improving public diplomacy in Africa. Russia’s relationship with the Southern African Development Community is also on the rise. The states of the region are seeking to diversify their foreign relationships. Moscow is helping them to achieve this goal, as it enjoys a reputation as a reliable and pragmatic partner that is able to weigh in on regional matters both diplomatically and militarily. It maintains good relations with everyone in the region, making Russia the right choice when seeking a partner for a peacekeeping operation. Russia’s burgeoning influence in sub-Saharan Africa is a part of broader picture, as its clout has grown immensely in the Middle East and North Africa.